Virginia has produced some of the greatest athletes in the world. These five NFL stars are no exception. The Commonwealth has made an undeniable impact on the NFL, producing league MVPs and the game’s all-time sack leader. Thanks to a competitive high school football scene and powerhouses like Virginia Tech and UVA, Virginians continue to dominate the NFL today. Honorable mentions include Kenny Easley, Tiki and Ronde Barber, Charles Haley, Russell Wilson, and DeAngelo Hall. While Vick’s career may be best remembered for his infamous arrest and jail sentence, there’s no denying his dominance on the field. The pride of Newport News chose to stay in his home state by attending Virginia Tech, where he would go on to establish himself as one of the most unique QB prospects of all time. Vick’s prowess through the air and on the ground helped the Hokies go 11-1 in back-to-back seasons. Vick finished third in the 1999 Heisman Trophy race and became the number one overall pick in the 2001 NFL Draft. While many other Virginians went on to have better overall careers, Vick’s impact on the game cannot be overlooked. He is without a doubt the NFL’s most dangerous duel-threat QB. His 6,109 rushing yards are by far the most ever by a QB, and he became the first player at his position to rush for 1,000 yards in a single season. This Clover product had a historic NFL career in many ways. Not only was Lanier an incredible player, but he was also the very first African American LB to ever suit up in the league. Lanier also played in the game’s first Super Bowl, eventually claiming a title in 1969 with the Kansas City Chiefs. While Lanier was given the nickname “Contact” by his teammates, it was his prolific versatility that made him a Hall of Famer. His 27 interceptions and 15 career fumble recoveries rank among the game’s all-time greats. Not bad at all for an unheralded prospect out of Richmond’s Maggie L. Walker High School. Much like Vick, Tarkenton was a threat throwing and running the ball during an 18-year NFL career. The undersized QB practically invented scrambling during the 1960s. Originally from Richmond, Tarkenton played high school and college ball in Georgia. He led the Minnesota Vikings to three Super Bowl appearances in a four-year span. 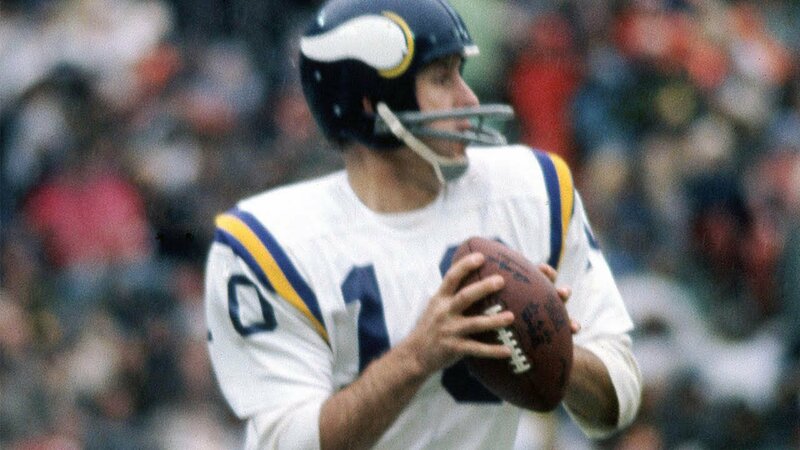 Tarkenton’s incredible resume includes nine Pro Bowl appearances and MVP honors during the 1975 season. He was inducted into the Pro Football Hall of Fame in 1986, the same year as Lanier. Lawrence Taylor changed the LB position forever. Born in Williamsburg, Taylor didn’t even play the sport of football until his junior year at Lafayette High School. After a standout career at UNC, Taylor was selected second overall by the New York Giants in 1981. He would go on to become perhaps the scariest edge rusher in league history. In 1986, Taylor recorded 20.5 sacks -- two shy of the single-season record. He would also win the league’s MVP award -- the last defensive player to do so. Taylor won two Super Bowls with the Giants and is consistently viewed as one of the greatest defensive players in the game’s history. Ranking Smith ahead of Taylor may be controversial, but it’s hard to argue against the NFL’s all-time sack leader. The Norfolk native set the college football scene on fire while attending Virginia Tech, eventually becoming the number one overall pick in the 1985 NFL Draft. Smith terrorized opponents during the Buffalo Bills’ finest era as a franchise. He recorded double-digit sacks in a whopping 13 NFL seasons, while leading the Bills to four straight Super Bowls. The two-time defensive league MVP spent his final years with the Washington Redskins, finishing his career with 200 sacks -- the most all-time. What separates Smith from Taylor was his longevity and incredible consistency. He played for 19 seasons, not retiring until age 40. Smith currently resides in Virginia Beach. What do you think of this list? Did we leave any players out? Let us know in the comments!